For those who have been following my cattorney Georgie Greyskull's adventures in grooming, that's him sporting his lion's cut for summer. He just so happened to walk into the frame as I was snapping a photo of the stuff turfed out of my daughter's bedroom yesterday. 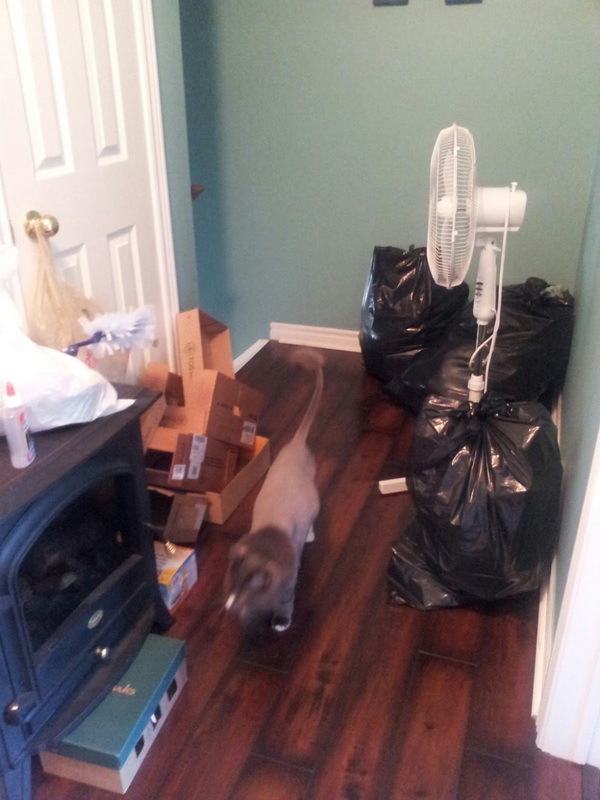 That's three garbage bags full of landfill - crap that she had squirreled away under her bed, under her toy shelves, behind her dresser, behind her curtains and in cardboard boxes that she had neatly stacked in one corner. I never gave the boxes any thought. I just figured it was her making an attempt to create homes for her hundreds of dinosaurs (her now four-year-long obsession). Nope. What I found were paper plates from parties past, plastic bottle tops, random McDonald's toys, every single casing to every Kinder Egg she'd ever been given, easter chocolate from last year and maybe the year before. Used staples (the hell, right? ), pushpins, suction cups, the sticky censors from her dad's last electrocardiogram, unused band-aids, nasal strips, etc, etc, etc ... nothing gross or dirty, just an odd collection of crap. It's like she couldn't stand to see anything thrown away or she was compelled to take things as a souvenir. The most interesting discovery was that she had a collection of receipts from gift shop items I had bought for her from various attractions over the past year - Canada's Wonderland, Centreville, Bomanville Zoo, CN Tower, ROM, Great Wolf Lodge, Cedar Park Resort ... she would have had to have fetched them from the bags. As I was chucking stuff with her watching, I was looking for signs from her typically seen on the faces of the people profiled on those hoarding reality shows. Lucky for me, I saw no sign of extreme attachment or anxiety that made me feel a trip to the doctor was in order. So we had a little chat about how it's okay to throw things away and how some things can be kept in a memory shoebox. I showed her my two memory shoeboxes and said I would help her start her own, beginning with the autograph she got from magician Greg Frewin. She seemed pleased to learn that things can be kept that have meaning and other things just shouldn't be collected such as staples. There must have been fifty used staples in one box. Also very strange was the pile of dried basmati rice at the bottom of her toy bag. Seriously? My daughter keeps a relatively neat room, which is why I never gave any of this crap a closer look. We also have a cleaning lady so it's not like I'd have a good reason to be manhandling her stuff. I don't know if she was intentionally strategic about the storage of these items or she just wanted some kind of order to her "collections". Oh, and for the troll who always asks what these off-topic posts have to do with riding a GO train. Nothing. But she did have a receipt for a GO train trip she took with me during the March Break. Don't feel bad, my son used to collect the tongue depressors from doc offices. He'd have a meltdown if he couldn't leave with one. He was nine when he gave it up. He's 22 today and in his third year of engineering at Ryerson. She'll be okay. I wouldn't worry until she's like that lady on Hoarders who's toilet was full of literal crap. Did she hoard the fan and fireplace, too? LOL. No. Both need to go into storage in the garage. It is gonna hit 25C today and you're gonna put the fans in storage? Will ya donate em to me? I got Chinese landlords who think the time to turn on a/c is at 32C... well after I feel more draining from me. I like crisp temperatures of -5C to 15c... with no humidity.